Having a diversity of casino games is the expertise of TimeSquare (TS) Casino. It claims that it prioritizes the needs of its players by making sure it offers the newest and hottest games in the industry. The betting site also accommodates those who are new in the industry by offering titles that can be played using fun credits. In terms of licensing, TS Casino operates under the laws of Curacao. All data are secured as the gaming site uses a 128-bit Secure Socket Layer (SSL) encryption technology. The site also follows security standards to make sure that you have a secure gaming experience. TS Casino also offers you 24/7 live chat support that can guide you around the gaming portal. You can easily contact the support team in case you have concerns or problems regarding gaming. Continue reading to know more about the other advantages that you can get when you sign up with TS Casino. New members of TS Casino are eligible for this welcome package. Players can get three different deals on their first, second, and third deposits. 1st deposit – Get the 100% Max Bonus up to €500 with 50 free spins. 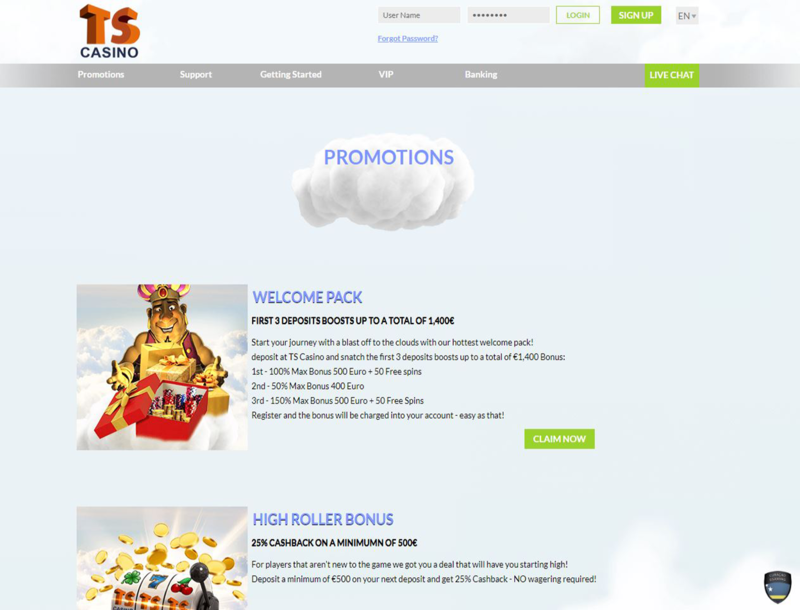 2nd deposit – Get the 50% Max Bonus up to €400. 3rd deposit – Get the 50% Max Bonus up to €500 with 50 free spins. Should you decide to withdraw this reward, you must first wager the deposit amount 35 times. You can get your hands on a 25% cashback by simply depositing at least €500. The good news is that there are no wagering requirements to get this deal. Other than the 25% cashback bonus, you can receive a 10% cashback every week. The minimum cashback that you can get is €5. TS Casino is generous enough to give you incentives during the weekend. You can receive a 50% bonus up to €100. All you have to do is make a deposit on a weekend and play your preferred game. These are just some of the promotions you can activate on TS Casino. Other bonuses available are Free Spins Celebration, Payment Method Deposit Bonus, and Free Online Casino Bonus. You can also join the VIP program to get special prizes. There are two categories under the Game section of the betting site: live casino and video slots. If you want to see all of the titles offered, you can go to the main Game Category to see over 90 HD games on board. Navigate through the Video Slots section, and you will find popular Bitcoin slots from renowned game providers such as 1×2 Gaming, Betsoft, and ELK Studios. Some of the games available are Book of Dead, Imperial Opera, and Exotic Fruit Deluxe. Meanwhile, the Live Casino section consists of different versions of roulette and blackjack. If you are looking for more games like dice or poker room, you will not find those in this gaming hub. You might be disappointed as well that the betting site has a small game library. 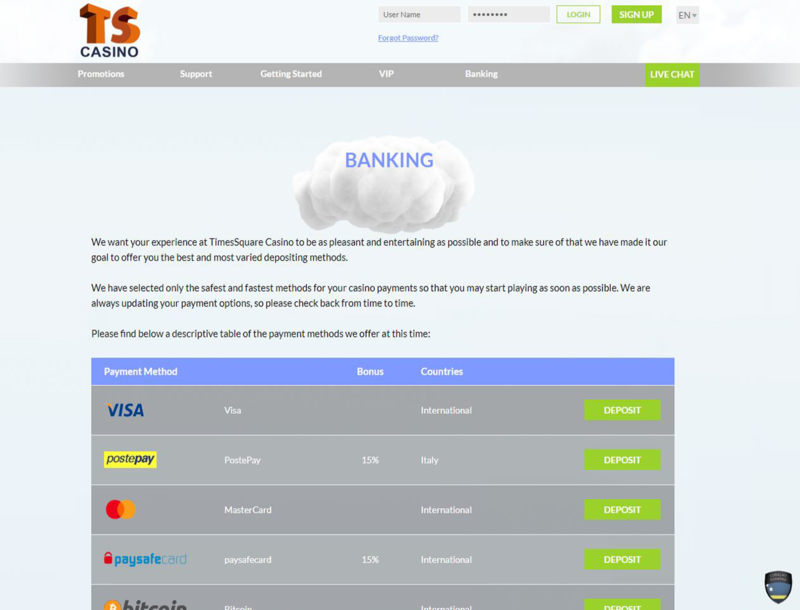 Although the games offered are few, you will appreciate it that TS Casino supports a wide range of payment methods. You can pay via Visa, paysafecard, and Neteller, to name a few. The default currency accepted is EUR, but you are allowed to pay using your desired currency including BTC. The gaming portal does not state its minimum and maximum deposit limits. Although it did mention that there is a limit per transaction. In this case, you need to contact the customer support to know this information. For withdrawals, the smallest amount that you can cash out is €100 and the highest is €5,000. Just like most Bitcoin casinos, TS Casino aims to be one of the leading betting sites in the industry by offering you attractive deals. From the moment you sign up, you can get rewarding promos from the casino. Plus, payments are convenient because the site supports a wide range of fund transfer options. The only problem is the small game library. There are just less than 100 games offered, and these are limited to slots, roulette, and blackjack. Nevertheless, all these are of high quality as they are from renowned game providers. So despite having a small game library, TS Casino is still a good casino to sign up with.